Sales incentives are a great way to increase sales activities on your team. With a small contest or spiff, you can quickly rally your team and drive focus, energy and excitement around key initiatives. But too often, sales management assumes that the best sales incentives are the most expensive. That’s not quite the case. In fact, research has found that experiences make people happier than material things. Consider skipping the Apple Watch or Rolex this year, because we’ve got a list of fun, affordable sales incentives that will motivate your reps without burning a hole in your wallet. Gift card for any fun office accessory. Hang a hammock somewhere in or near the office and let the rep hang out for an hour. What’s your rep’s favorite type of food? Set up a potluck with that theme. Already planning on sponsoring a conference, but not sure who to send? Choose the rep.
Small figurine from the rep’s university that they can put on their own desk. Give the rep a desk with a better view. Let the rep bring their pet to work for a day. Get the rep a fun business book (*note – make sure it’s one that would interest them) and have everyone in the office sign the cover. When you have VIP contacts in the office or at a conference, facilitate an intro between them and your recognized rep.
Rep gets their favorite ice cream to eat at work. Get the rep a basket full of gag gifts that he or she can use for some fun around the office. Have TVs in the office? Let the rep choose what channel they’re on for a week. Fun toy from the rep’s childhood to keep on their desk – think Magic 8 ball, silly putty, pet rock, etc. Let the rep choose one song that the entire team has to sing to them before the next team meeting. The list of inexpensive sales incentives doesn’t stop here. 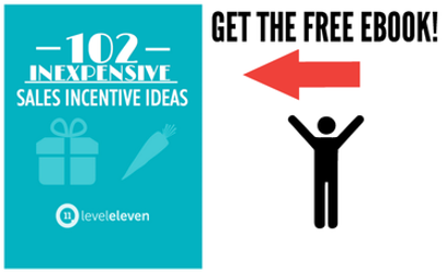 Grab a copy of our most popular eBook for more unique and fun ideas to motivate your team. Sales leaders assume that the best sales incentives are expensive, but these sales incentives will motivate your reps without burning a hole in your wallet.